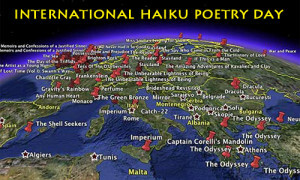 You are here: Home / EarthRise Rolling Haiku Collaboration / IHPD2019 — It’s Almost Here! We look forward to sharing your HaikuLife, video haiga, or other haiku video production with the haiku community. We will screen offerings in 3 modes: HaikuLife Format (17 segments of 17 seconds each: view our demo); Free Format (pretty much anything goes, and including video haiga like this one); and Feature Format (we select one film to be the anchor of the festival). The United Nations has designated 2019 as the Year of Indigenous Languages. 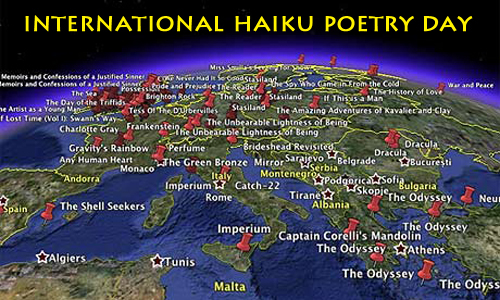 Plan to share one poem or many in the world’s largest collaborative poem — last year we had over 500 submissions! (Perhaps we ought to give The Guinness Book of World Records a call . . .) Beginning at 1 minute past midnight at the International Dateline. Terri L. French writes:  I will read next Wednesday night at Redstone Village Retirement Community “Poetry Night” in Huntsville, AL. I will be reading several haibun, including a few from my book, Keepers. Ellen Evans writes: I have issued a haiku challenge to all the residents in my retirement community to write one or more haiku of any subject they choose. My neighbors include more than 300 seniors between the ages of 62 and 98. At 8:59 PM on April 16 I will remove the individual haiku submission slips, mount them to posterboard, and hang them in a prominent location by the 17th, where they can be enjoyed by all. By Friday (April 12) we had already received 97 individual haiku with four days remaining — the enthusiasm here is impressive! John S. O’Connor writes: I am hosting an event, The Inheritance of Memory: Songs, Poems, and Stories, at the East – West University at 816 South Michigan Avenue in Chicago at 7:00pm on April 17, 2019 — International Haiku Poetry Day. You can find more information here. See you there! And, as usual, we announce the winners of the Touchstone Awards: the Touchstone Distinguished Books Award for books published in 2018; and the Touchstone Award for Individual Poems for haiku published in 2018.